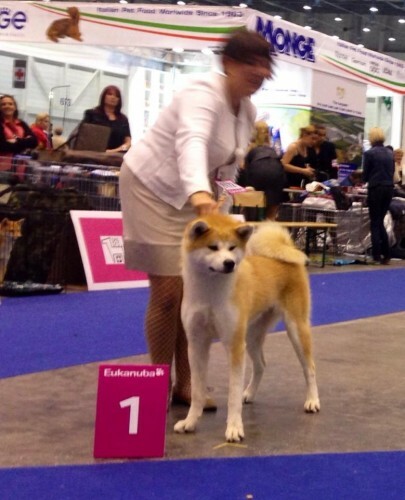 UNA SODDISFAZIONE IMMENSA A GINEVRA CON DUE NOSTRI SOGGETTI ALLEVATI DA NOI CI PORTIAMO DALLA SVIZZERA DUE TITOLI SU 4 IN PALIO OLTRE AL CAMPIONE EUROPEO VINTO DA HACHIKO SAMURAI AKI CAPRI LA DOLCE HASUNOHANA CI REGALA IL PRIMO POSTO ED IL TITOLO NONOSTANTE NON IN CONDIZIONI DI PELO PERFETTE!!!! CON I SUOI OCCHI ESPRESSIVI HA INCANTATO TUTTI!!! CI SPIACE LA SCARSA QUALITA’ DELLA FOTO MA L’EMOZIONE FORTE NON CI HA PERMESSO DI IMMORTALARE L’ATTIMO COME MERITAVA.